When we think about stressed out dogs, we often think about the effects of negative stress such as the stress dogs feel when they are moving, at the vet's office or when they are re-homed or boarded in a kennel. This type of stress is what we are most familiar with as we experience it too when we encounter difficulties in life such as working under pressure, losing a loved one, going through a divorce or coping with an illness. Whether stress is acute or chronic, you may have encountered the effects of stress sometime in your life as tension builds up and you feel overwhelmed and drained. This type of negative stress is not just a feeling; indeed, internally, all sorts of physiological changes take place as the blood pressure rises, your breathing becomes more rapid and your heart beats faster. On top of that, circulating levels of blood glucose increase and you may lose your appetite as blood is diverted from the stomach to your extremities so you can sprint into action as needed. These changes seen in acute stress are due to the effect of the sympathetic nervous syndrome which releases adrenaline and activates the "fight or flight response," a primal reaction that in the old days gave us that boost of energy necessary to escape from predators or fight against enemies. However, unlike animals who for the most part activate their stress in response to short-term dangers and run away from predators or fight, us humans are often left with stress that bottles up and is more likely to cause cardiovascular disease, loss of sleep or an ulcer. Problems start when persistent stress is not resolved through coping strategies or adaptation, causing it to negatively affect us in many ways. A great read for anybody dealing with stress is the book by Robert M. Salposky "Why Zebras Don't Get Ulcers" which goes in detail on how stress affects our bodies and frequently compares our stress to how animals cope with stress. When stress has such a negative impact on our lives, we are talking about "distress," the term used to depict the type of stress that negatively affects our well-being and overall health and efficiency. This is the form of stress we are most familiar with, and what we refer to when most of us talk about stress. 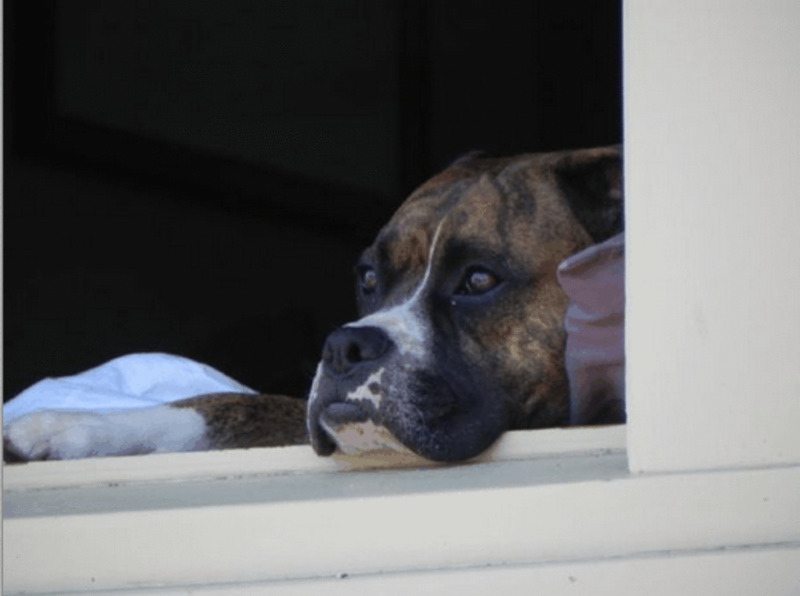 Dogs can suffer from chronic forms of stress as well and constant and cumulative stress can cause long-term consequences to the the health of the dog. Yet, not many know that there is another form of stress affecting both dogs and human beings. It's called "eustress" and is worth mentioning so we can better understand ourselves and our dogs and the impact this form of stress may have on how we deal with certain situations. Stress is not always a bad thing! When I was a child, I was very passionate about horses and had the fortune to own a couple as I was growing up. As summer rolled out, I decided to enroll my sorrel Holsteiner in a contest. I was very excited about it; indeed, that morning I woke up at 5AM unable to sleep. My heart was pounding and I had no appetite so skipped my breakfast. When my mom asked me why I couldn't sleep and wouldn't have breakfast, I remember telling her that I had a bout of what back then I called "happy anxiety." Now, many decades later, I know that the correct term for that feeling was "eustress." As with distress, eustress causes several physiological changes, but in eustress, these changes improve performance, motivate us and overall feels pleasant as this stress enhances our functioning and promotes health and growth. It was Hungarian endocrinologist Hans Seyle who coined the terms "distress" and "eustress". The Greek prefix "eu" in eustress means good, so it means "good stress." As with distress, the term eustress is not meant to denote any particular trigger or situation, it's simple based on one's personal perception of a stressor. So what may cause eustress in one person may not cause eustress in another. Unlike distress though which negatively impacts health, efficiency and wellbeing, eustress is associated with life satisfaction and wellbeing. Eustress is what keeps us vital and excited about things that happen in our lives. Eustress can occur when we encounter a fun challenge or when we look forward to an event. Examples of events that may cause eustress include starting a new job, getting married, going on vacation, gambling, participating in a sport, or visiting an amusement park (if you enjoy roller coaster rides). 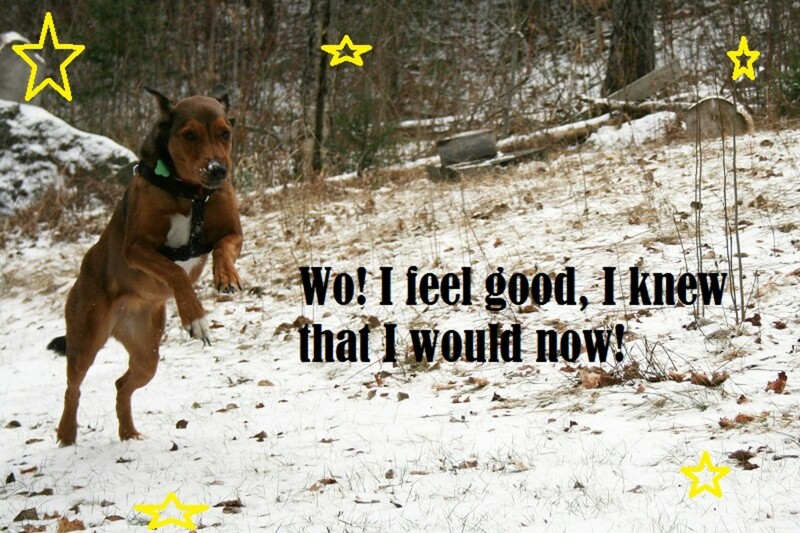 However, as good as eustress may be, our bodies, and the bodies of our dogs, seek balance. Yes, eustress can also be classified under the "too much of a good thing" category. While eustress won't likely impact your life negatively as distress does, it can still tax your system, explains Elizabeth Scott, a wellness coach specializing in stress management. That's why it's important to have 'down time' and balance in one's life, she adds. And this applies to both people and dogs. A classic scenario is the dog who is taken every single day to day care and is allowed little downtime from one day to another. Bombarded with high levels of arousal each day, the dog never has a chance to dissipate them as he's not allowed any down time. 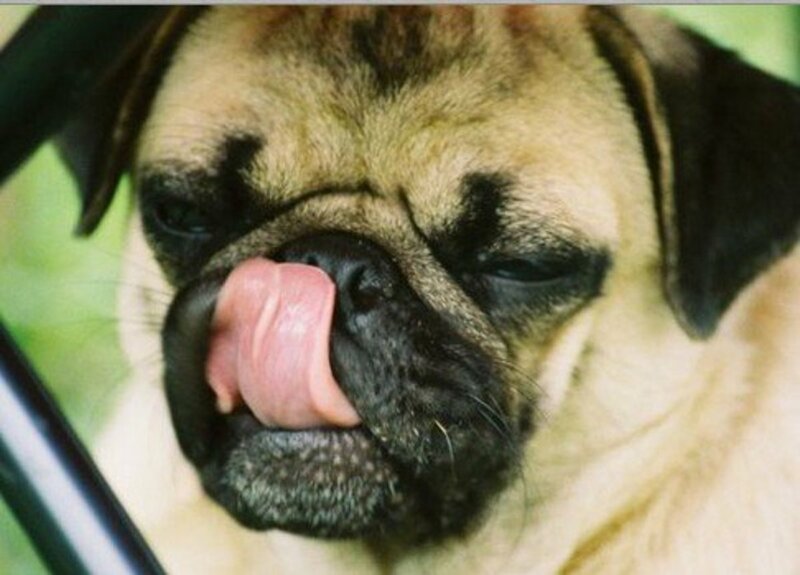 Day after day, the dog becomes chronically stressed which leads to hypervigilance and reactivity in the long term. Fact is, in dogs, there's a point where eustress may convert into acute distress, explains David Ryan, a Certified Clinical Animal Behaviourist in the book "Dogs that Bite and Fight. A Guide for Owners and Trainers." This can be seen when dogs escalate in rough and tumble play past beyond the point they're capable to cope with, with the end result of flipping into a burst of aggression. Fact is, there's a thin line separating eustress from acute distress (the sudden eruption of negative stress) in dogs. Both of these forms of stress share the fact that the aggression threshold may be lowered as impulse control and social inhibition processes are bypassed. David Ryan compares it to the overreactions we sometimes see in professional football players when they could have just plain and simply walked away from a heated situation. 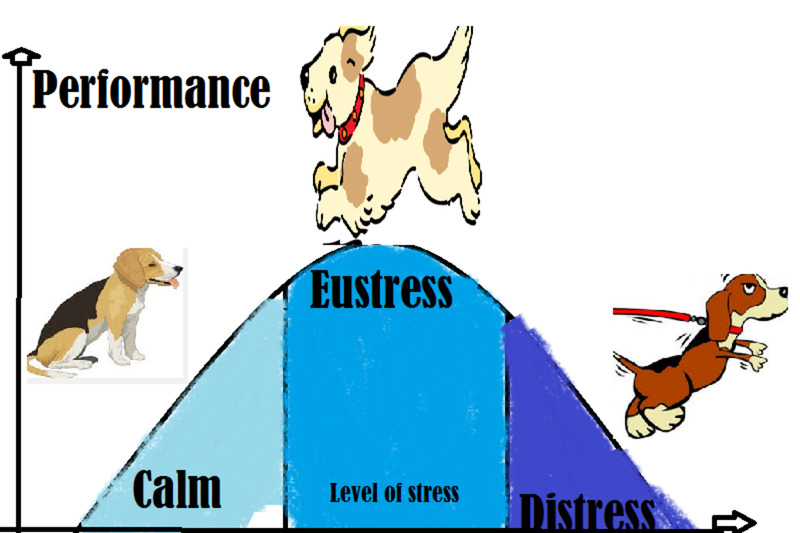 When it comes to performance dogs, it's true that eustress sharpens the senses and that peak performance is attained when a dog is in this state (see graph), but get too much of it and the performance may fall apart due to lack of concentration and impulse control. The good news is though that dogs can be taught to cope better with stress whether it's the negative type or the positive type. Better coping skills pave the path to better tolerance of stress and a better ability to perform despite exposure to high levels of stress. Humans are not the only ones to fall victim to the cumulative effects of stress; dogs do too! Trigger stacking in dogs may have deleterious effects that can pile up and cause bouts of aggression. How do dogs respond to stress? You'll be surprised how the dog's body prepares him for action when under stress. Understanding the dog's stress response by looking at the sympathetic nervous system. 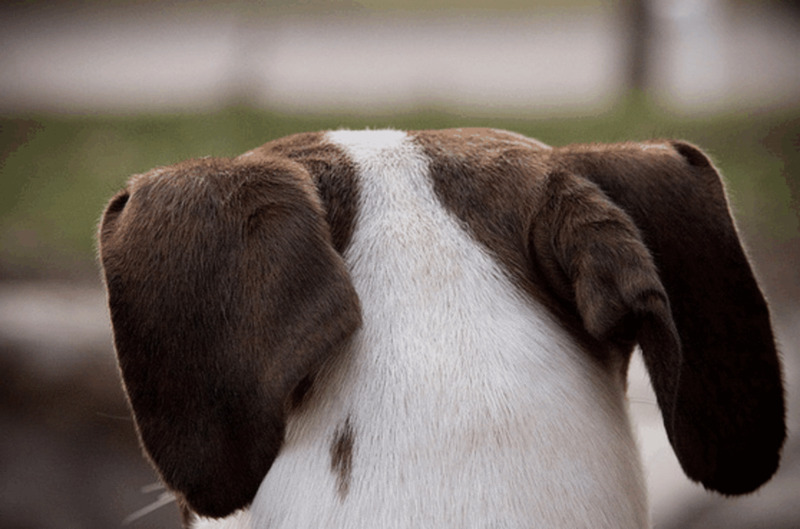 Understanding dog fight and flight response is important if you're planning on learning more about your dog behavior. 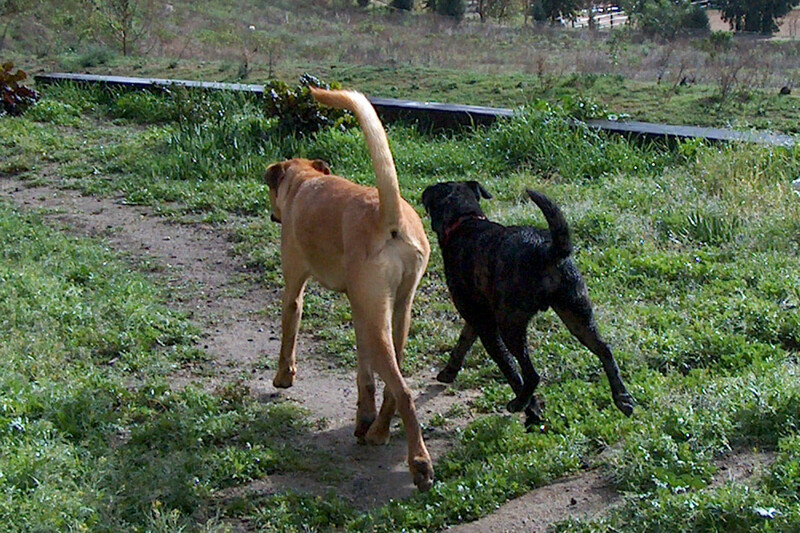 Learn how fight & flight responses are important in changing dog behavior.